For the majority of the time that I’ve been writing professionally, I’ve been plucking away at the constant temptation to switch over to the Mac platform for all of my productivity hardware and software. The reasons, overall, haven’t changed that much over the past several years. I was in college when I first began to dabble with Macs, and I always enjoyed the reliability that they seemed to exude. When your livelihood is dependent upon that reliability, you start to take notice! The first reason that I couldn’t buy into Apple was price. As a poor college student, refurbished Windows PCs were the best that I could afford, but now that I’ve established a routine, a work habit, and professional ventures, I’ve found that the MacBook Pro, which captured my jealous attention years ago, no longer has the requisite power to support the work and play that I want to do. As mobile computing has grown more powerful and able to fit into smaller form factors (across a wider variety of machines from many manufacturers) now would have been a great turning point; a chance for Apple to reintroduce the MacBook Pro as a balanced, capable workhorse that can tackle any professional productivity we deign to throw at it. As we saw at WWDC, and as we’ve witnessed in the past few months, that didn’t quite end up being the case. The future of the MacBook Pro is on unsteady ground for many diehard Apple fans, and it’s tough to know if the reputation it’s maintained—as the go-to machine for creative professionals—is still going to stick. We can be glad that Apple didn’t decide to ditch the headphone jack on the newest MacBook Pro. It’s still there, and it still works as well as ever, which means we don’t have to depend entirely on wireless solutions, as we do with the iPhone 7. However, all of the other ports on the computer have been replaced by USB-C. All of them. There’s no standard USB 3.0, no HDMI, and no SD card reader—a favored feature among photographers. If you’re an owner of the new MacBook Pro, you now live in “dongle hell,” wherein any device or peripheral that doesn’t operate on USB-C has to use a dongle to connect to your computer. It is true that this port type is among the most efficient on the market; it’d be a blessing if more of our devices did embrace USB-C, but the reality is that many don’t. Apple has shown us how effective it can be, but many owners of previous iteration of the MacBook Pro remain miffed that only a single port type is supported. While the current lineup of Macbook options is certainly powerful enough for simple computing tasks, they’re not enough for users that want a more powerful solution. Video editing while also running Photoshop? Gaming? 4k resolution output? Eventually, virtual reality support? Apple had a chance to truly rise to the competition, here, and put out a computer that professionals in various different fields would want to use. That…hasn’t exactly been the case. The new graphics chips from AMD certainly allow the MacBook Pro to remain competitive when stacked up against competing ultrabooks—dedicated graphics will always be better than integrated chipsets, after all. However, when you compare it to similarly decked-out computers like the Razer Blade or Microsoft’s own Surface Book, the MacBook Pro just does not hold up. Many creative professionals have been irked to find that they’re paying premium prices for hardware power that’s outdated, at best. This forces consumers to pose a question to themselves—is the MacBook Pro truly the right choice for creative professionals, any longer? Microsoft’s own Surface brand has taken leaps and bounds toward that market, and given the reaction to the MacBook Pro refresh, Microsoft might be a in a prime place to make a strong use case for that crowd. Even though you can set up dictation on your Mac using OS X that doesn’t excuse the longstanding absence of Siri from the MacBook lineup, or from anything that isn’t iOS, for that matter. Google has upped the ante with the versatility of its own personal assistant, and Microsoft’s Cortana is getting better with each Windows update. Now, we’re happy to finally have Siri on the MacBook Pro. It doesn’t quite provide the same experience that you’re going to have on an iOS device, but if you’re fully committed to the Apple hardware and software ecosystem, this is an important bridge that didn’t exist in the way that it should have, before. Having Siri on the MacBook Pro is a small win, but a win nonetheless. When many users think of touch functionality on a computer, they immediately leap to the assumption that it has a capacitive touchscreen. In almost every model on the market that’s touch-enabled, they’d be right. However, Apple has chosen to go a different direction with the higher-tier models of the MacBook Pro. As had been rumored for months before any official announcement, the “Touch Bar” is the most prominent new feature on the new machine. To be fair to Apple, the Touch Bar has some fans. Those who delve fully into its functionality have found that it can improve their workflow and avoid the typical DNS Windows errors, but only if that workflow includes Touch Bar support in the applications that you’re using. More and more are, all of the time, which is reassuring. 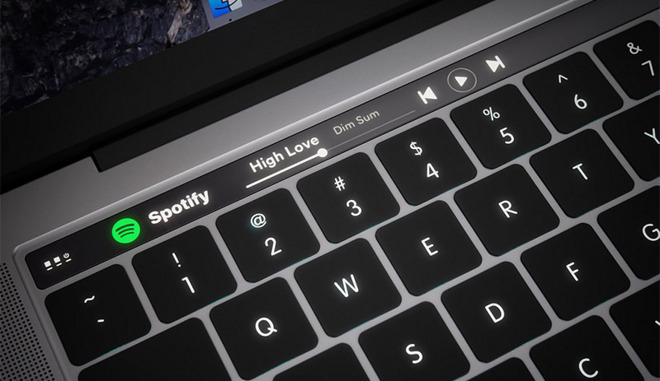 However, quite a few users have found that the Touch Bar is nothing but a gimmick; a poorly-implemented scapegoat that allows Apple to produce touch-enabled computers without equipping them with a full, capacitive touch screen. Because this feature is particularly divisive, it’s hard to say who, exactly, will benefit the most from its implementation. I would recommend that users take a swing through their nearest Apple store to try it out, before ever committing money to it. And as I mentioned above, you will be spending more money for the Touch Bar. As expected, the new MacBook Pro is the thinnest yet. Its form factor is as attractive as ever, and those who use one of these new machines will probably marvel at how much snappy efficiency has been packed into a single case. Now that consumers have had a chance to play with the computer for a few months, however, I’m forced to wonder at how much power was exchanged in favor of producing a thinner computer. The MacBook Pro is, without a doubt, a fine upgrade from the MacBook Air. It’s even an upgrade from the previous iteration of the MacBook, but the argument I’m tempted to make isn’t much different from when we talked about power, above. When I’m spending money on a “Pro” machine, it needs to have the horsepower to back up the price incline. The MacBook Pro is a beautiful machine thanks to its form factor, but it isn’t a particularly powerful machine. Even with the inflated cost of an Apple computer when compared to similarly-specked machines (a fact I’m actually okay with), the refreshed MacBook Pro doesn’t hold up to the expectations that I have for it. Oh, my. Where to begin with these to elephants in the room, especially with press that they’ve been getting lately. Look, I won’t dispute that Apple Music is an excellent streaming music solution—I gave the free trial a whirl, I loved it, but ended up sticking with Spotify because it allows me to more easily share my playlists with friends. The social experience is important, and I’d have lost about half of that if I had abandoned one for the other. I’d even be willing to get on board with both at the same time, but Apple has yet to rectify the awkwardness that exists between iTunes and Apple Music. The MacBook Pro refresh would have been a great opportunity to better integrate these two enormous parts of the Apple software ecosystem. The former has become bloated to the point of being unwieldy, and the second feels like an exclusive “members-only” club that’s difficult to pitch to anyone who isn’t onboard with Apple in other software areas. Unfortunately, it hasn’t happened. That’s only part of the bigger picture, however, and the bigger picture seems to be saying that there’s less reason for before to view the Apple (and by extension, Mac) ecosystem as being the place for creative professionals. We’ve recently heard that Apple may be working on its own chips for the next iteration of the MacBook Pro. We’re going to have to hope that a few lessons have been learned from the consumer backlash from 2016; I still really would like a solid-gold reason to want the new MacBook Pro.